I've been trying to dedicate Sundays to finishing my Bonnie Hunter "Celtic Solstice" mystery quilt. 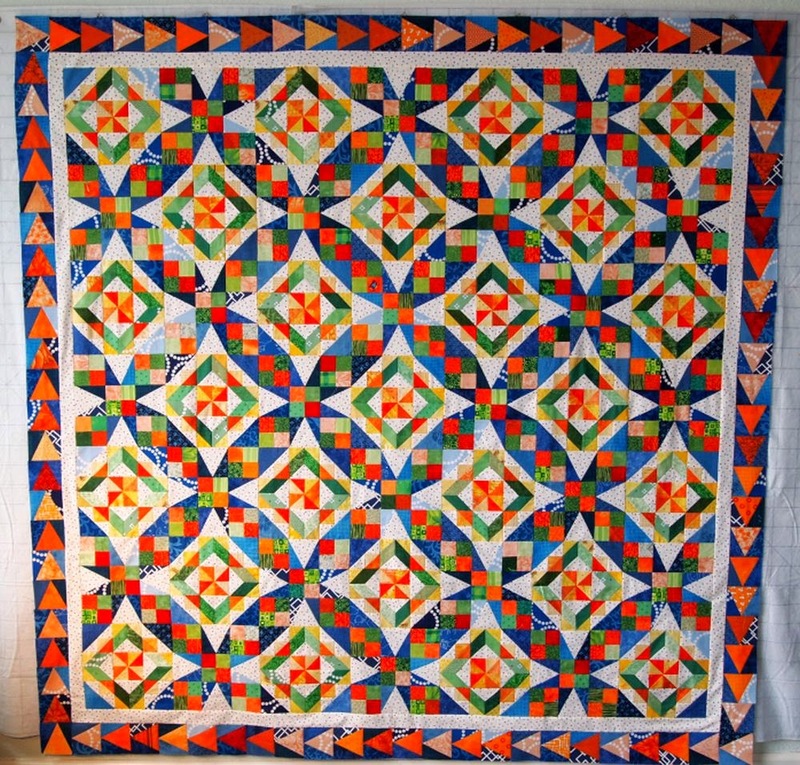 Today I sewed together and added the second border, the orange and blue tri-rec squares. Bonnie's directions call for a 2.5" green border on this size quilt. That just seems too narrow to me. I'm curious to know, from others who've made this quilt: "What size did you make the last border?" Linking up to Sew Darn Crafty at Sew Many Ways. Tomorrow, those of us who are making A Quilt Block a Day should have 40 blocks completed. Are you keeping up? Come back tomorrow to see how I'm doing! I'm with you - I think of a 2.5" as a middle border, not a final border! I'm doing the 3.5" pieced one and then possibly another middle one, and finally a 7.5" big one. It looks stunning, but I think the narrow border would be too small too. I think it looks great as it is now. It's so beautiful... I love the colors you used! Your Celtic Solstice quilt is looking stunning as it is. You gave me a good idea select one day of the week just to work with my CS. Have a wonderful week. Great quilt top! I have one block done...that might be a little short. Gina, I'm doing my Block a Day blocks as my Leaders and Enders project. It's amazing how much one can finish that way! This quilt just gets better every time I see it. I quite like the way it looks right now so if it were mine I would just add another white border the same size and then the binding in blue would finish it off for me. Of course I'm not sure if you're trying to get to a particular size! I made my finale border 3.5" and it worked out and looks good, I made the smaller size one. Your Celtic Solstice looks beautiful! Thanks, Christine! I'm thinking 6" finished for the outside border -- I should see how it fits on a bed first, huh? I could see another narrow white border just like the first to frame the pieced border, followed by a wider outer border.